The Curious Incident of the Dog in the Night-Time, Gielgud Theatre. The West End run of The Curious Incident of The Dog in the Night-Time came to a sudden end in December 2013 when the ceiling of the Apollo theatre collapsed. The original hilarious and heart breaking crossover novel for adults and children won the Whitbread Book Award for Best Novel and Book of the Year, the Commonwealth Writer’s Prize for Best First Book, the Guardian Children’s Fiction Prize and was also shortlisted for the CILIP Carnegie Medal Award in 2003. The novel follows the story of Christopher Boone, a fifteen year old boy who describes himself as a ‘mathematician with some behavioural difficulties, living in Swindon, Wiltshire.’ Christopher attends a special needs school not because of his physical disabilities or epilepsy but because of his poor social skills and the effect they have on his behaviour. The idea of the central character of fiction being socially naive is of course not new. Voltaire’s Candide, or the child in the Tin Drum, or Pip in Great Expectations are memorable examples of how through the eyes of an innocent – the story, the deceit-ridden, emotionally charged world of the adults around them takes on a totally new perspective. Simon Stephens manages to crystallize that metaphor in his stage adaptation, which mirrors Haddon’s structure of a book within a book, by presenting Christopher’s experiences as a school play, narrated by his teacher Siobhan (Sarah Woodward). Happiest contained in a small space with no one else but Toby the rat, Christopher is propelled into a terrifying world of messy emotions and lies when he finds the neighbours dog ‘Wellington,’ impaled with a garden fork. I do not agree with critics who have said the play lacks the quirkiness of the original novel. This is a very lazy reading of the production. Bunny Christie’s ingenious design – a monochrome mathematical grid onto which diagrams, rail tracks, emotions and cascades of numbers are displayed – is an inspired representation of Christopher’s mind. Coupled with Paul Constable’s lightning design, it brings the production into the dimension of theatrical greatness. Potentially one of the first instances of ‘total theatre’, in this generation. You can see exactly where the money you paid for your ticket went into this production, as it is a real showcase for how to utilise modern-day technology on stage. However this decision by the director has not just been made to show off to the audience. More importantly it makes real the confusion and sensory processing difficulties experienced by Christopher on his lone journey from Wiltshire to London in search of his mother. The limited space of the stage that the actors have to work in only heightens Christopher’s feelings of not being able to cope. There were definitely moments when I found the sensory overload uncomfortable and wished to be outside. The theatre gives you a lived experience of how terrifying it is to exist in a world with any kind of learning difficulty, in a way that you can not get from just simply reading the text. The role of Christopher Boone is demanding but also something of an actor’s gift in a similar way to playing Hamlet or Lear. Christopher functions on so many different levels, with a spectrum of rhythms, that only the most talented of actors could sustain the role. Luke Treadway famously won a Olivier award for his portrayal of Christopher, but it seems Abram Rooney can rival Treadway’s outstanding delivery making the character his own. In my opinion Rooney is a brilliant young actor who is sure to go far. However it is not Rooney alone who makes this production outstanding. All of the cast go out of their way to make the show what it is with touching performances from both Nicolas Tennant and Emily Joyce as Christopher’s parents Ed and Judy. Sarah Woodward’s attentive portrayal of Siobhan is also worthy of applaud. Mark Haddon said he also regretted the words ‘Asperger syndrome’ appearing on the cover of his novel, because of the misguided and heated debate that still goes on today over whether or not Christopher is a correct representation of someone with a learning disability? The assumption being that there is a correct example of a person with such a condition. We would never ask if a character in a novel was a correct representation of a pianist, or a mother or a buddhist monk, because there is no such thing. The same is true of people who are given the label ‘disabled,’ and we must never forget that these people are individuals. The labels used by pediatricians, psychiatrists, GP’s and other kinds of doctors and psychologists, tell us more about the people doing the labelling than the person being labelled, an important message in Haddon’s novel. Therefore I ask the question does Christopher seem real? Having worked as an occupational therapist for a number of years with children and young adults aged 3yrs-20yrs, with varying learning difficulties I can say that for me Christopher is very real. I can’t think of writer who has captured the voice of a young man with learning difficulties as spot on as Mark Haddon does in his novel. This is why I love the book and the play so much. However for me the brilliance of this adaptation lies in the way it presents the much darker scenes of the original novel. In my work I have seen the constant struggle parent’s and carer’s face in bringing up children with behavioural problems. I therefore feel that witnessing scenes such as the breakdown of Christopher’s parents marriage and his mother’s depression on stage are much more moving than just reading about them in the novel. Christopher’s own struggle does not end with him finding his mother, solving the mystery of who killed Winston and getting an A* for his A level Maths. The play does not sugarcoat the reality of living with a learning disability for when Christopher asks Siobhan at the very end of the play ‘Can I do anything?’ she refuses to answer. 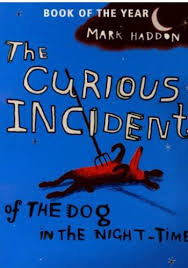 It is easy to see why ‘The Curious Incident of the Dog in the Night-Time,’ has won seven Olivier Award’s. All of the elements of the production work together in a beautiful unison to produce one of the best pieces of theatre I have ever seen in my life. I promise you will not be disappointed. A top tip without giving away any spoilers – don’t be in too much of a hurry to leave the theatre at the end of the performance otherwise you might miss out! Thank you to my wonderful husband for taking me to see the production and dinner at Simpson’s in-the-Strand afterwards wasn’t too bad either. Hmmm… I’m not sure why they wouldn’t be showing up?! I’m not the most tech savvy person either Sometimes I find the WordPress discussion forums helpful when I get stuck with something, which is more often than not! Let me know if you figured out a solution though! I love this book! We’re headed to London in about 3 months and your review has just added this to the list of things I want to get to. Great review, thanks! How good is that book?! You might like The Rosie Project as well if you like those two. I was born and bred in Hampstead and Kensington, only moved to Australia 10 years ago. I’m so excited to get back for a holiday and see my family. I love the sound of the Buddhist temple in Wimbledon, thanks so much, definitely something to check out. And I’m really looking forward to going to Waterstones in Piccadilly Circus – it’s my book mecca… Ahhhh, now I’m really excited! Guess what? I’ve already read The Rosie Project and I loved it. I gave it to my husband to read too and he really enjoyed it. I am an occupational therapist and my specialist area is Autism – so anything like that appeals to me. Do you like Caitlin Moran? If you do I would highly recommend ‘How To Build A Girl’, her new novel. She is one of the few writers like Marianne Keyes or John Green who can make me snort with laughter. Thanks Bridget, very kind of you to say so. I know exactly what you mean I often go to the cinema in Epsom to watch recordings of productions from the Royal Opera House. It does save a lot of time, effort and money. 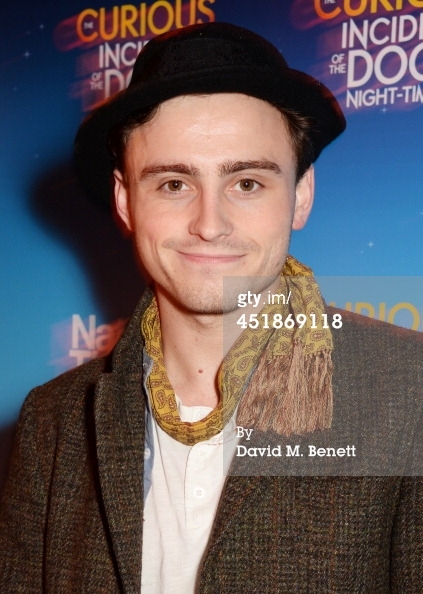 I was lucky enough to see ‘The Curious Incident of the Dog in the Night-Time’ live as it was a birthday treat. I’m not sure but you might be interested in the post I have just written on the Dublin Writer’s museum. Take care and have a great weekend. Emma. Thank you for the reblogg. I am glad you enjoyed both of my posts. Have a great week. Emma. I didn’t know there was a play. I stumbled on this book by accident, picked it up because the title struck something in me. A year later I read it and loved it. I’ve recommended it to many. It’s a fantastic book isn’t it? You may also enjoy ‘The Rosie Project’ by Graeme Simsion – a book about a man with asperger’s trying to find a wife. It is very well written and incredibly funny too. It has also been optioned for a film. Emma. Thank you for stopping by my blog. I am glad you enjoyed the review. Take care. Emma. Looks wonderful. I am attracted to anything with the name “Gielgud” in it. You would love the play. If you haven’t read the book I would get a copy of that as well. Take care. Emma. Ah, book adaptations! They are a constant peeve. Hardly do they do justice to the written word. But your structured review made me want to read the book, definitely. I like ‘outsider’ protagonists too, but not always ‘the underdogs’. Self-pity is so boring. A genuine lifetsyle /health problem with a genuine gutsy protagonists is fine, though. You will love the book. Ithas won so many awards I can’t keep count and the fact that it has been made into a stage show is evidence of how many peoples lives it has touched. Take care. Emma. I enjoyed the book a lot. I didn’t realize it was made into a play. Maybe it will come to the States. Or maybe it has and I am, as usual, several beats behind the current cultural conductor. Thank you for liking my recent blogs. I’m glad you enjoyed my post. It’s a fantastic book isn’t it? You might also like The Rosie Project by Graeme Simsion. It is about a man with aspergers who is looking for a wife. Incredibly funny and moving just like ‘Dog in the Night-time.’ Emma. I sometimes go to see cinema shows too, especially the ballet or opera. 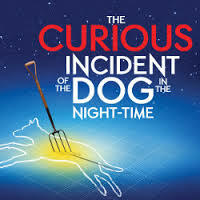 The theatre adaptation of ‘The curious incident of the dog in the night-time’ is wonderful. You may also enjoy a book called ‘The Rosie Project’ by Graeme Simsion, which is about an Aspergers man looking for a wife. It is incredibly funny and moving. Take care. Emma. One of my favorite books. I read it when it came out and have never forgotten it. You have made me want to read it again. Thank you for stopping by Food on Fifth and leaving such a nice comment. I love your blog as well. Thank you for your kind comments. If you liked ‘The Curious Incident of the Dog in the Night -Time’ you might enjoy a book called ‘The Rosie Project,’ by a writer called Graeme Simsion. It is about a man with aspergers who is looking for a wife. It is incredibly funny and moving. Thank you for the follow. I am following your blog too now. Take care. Emma. Thank you for visiting my Murder Blog today. I like yours so much I am now a faithful follower. Thank you for visiting my blog. I hope you will continue to stop by and find something of interest. I checked out a few of your posts and decided to follow. You have a wonderful, relaxed way of writing, like everyone that reads you feels like a friend. Thank you so much for your comments about my writing. You have given me confidence in my work again. Have a great week. Emma.